What does it mean to be exceptional? It means to be unusual, uncommon, to stand out from the rest. It means to be extraordinary, to act in ways that are rare and perhaps even unprecedented. Every 2nd and 4th Tuesday in Woodbridge, CT a group of exceptional people meets, led by an exceptional man named Dr. Bernie Siegel. Bernie is a former pediatric surgeon turned best-selling author, international speaker, spiritual guru and healer who has touched countless lives across the planet, including mine. Check him out at his website, www.berniesiegelmd.com. This support group is one of a kind. Formed in 1978, it’s called ECaP, which stands for Exceptional Cancer Patients. Early in his practice as a doctor, Bernie observed that there are certain behaviors that he calls ‘survivor behavior’ which lead to persons diagnosed with cancer or other debilitating diseases living more abundant, active and longer lives than what was expected based on statistics. Hear me now: being exceptional means not conforming to expected norms or standards. It means defying statistics, because human beings are not statistics. I was introduced to Bernie shortly after my 2009 diagnosis with late-stage breast cancer by a member of Marble Collegiate Church in New York City, where I was then serving as the Minister of Children, Youth, and Families. A friend gave me Bernie’s first book, called “Love, Medicine, and Miracles.” Written in 1986, it chronicles the lessons he learned about self-healing from his patients. Bernie states “miracles happen to exceptional patients every day–patients who have the courage to love, those who have the courage to work with their doctors to participate in and influence their own recovery.” Bernie believes that “unconditional love is the most powerful stimulant of the immune system” and through incredible stories of persons who overcame disease against all odds he uncovered the extraordinary truth that love heals. This book quickly became a best-seller. My husband and I were stunned to discover that Bernie lived one town away from us in CT. What’s more, he was offering a class on the Art of Healing at the local High School beginning in a few weeks. I took the class, and Bernie told me about ECAP and invited me to come. I started attending the meetings, which were unlike any previous cancer support groups I had attended. At ECAP meetings the people had the power, and each person thought outside the confines of the traditional medical box. No one was restricted to mainstream ways of treatment for their cancers and readily embraced the divine connection between mind, body, and spirit in the healing process. I felt like I had found new life through ECAP. I’ve been a member since 2010 and consider this a critical element of my healing regimen and a key reason why I’ve been thriving for almost 7 ½ years, despite a doctor’s prediction to the contrary. The inspirational and courageous stories of others on their Stage 4 cancer journeys have given me fuel for my journey and motivated me to keep going. I know God orchestrated this link and I am forever grateful. Yes, several people in the group have died in the years I’ve been attending. I harbor no illusions that people with late-stage cancer will live forever, but may I remind you that none of us will live forever. However, I am clear that the experience of belonging to ECAP and embracing its exceptional philosophy of healing love contributed to a fuller life for every person who has died. Our experience allows those of us who are still living to maintain the faith, strength, courage, endurance, and determination to keep moving forward on the journey even when we feel like giving up. A relevant message even if you don’t have physical cancer. Yesterday I went to an ECAP meeting, and as usual, I left feeling inspired and uplifted. I was revitalized by the members’ updates on what had transpired since we were last together. The spirit in the room breathed new life into me as well. One woman testified that due to the group, she had gone from wanting to throw in the towel to feeling like living again. She switched doctors and was a new person – almost unrecognizable from the last time she had been there. We all clapped and shouted hallelujah for her transformation – what a joyful time we had in the presence of the Great Healing Spirit! The symbol displayed above is an interpretation of Mary's words. Called Gye Nyame, it represents the omnipotence and supremacy of God, meaning no force can do it except God. 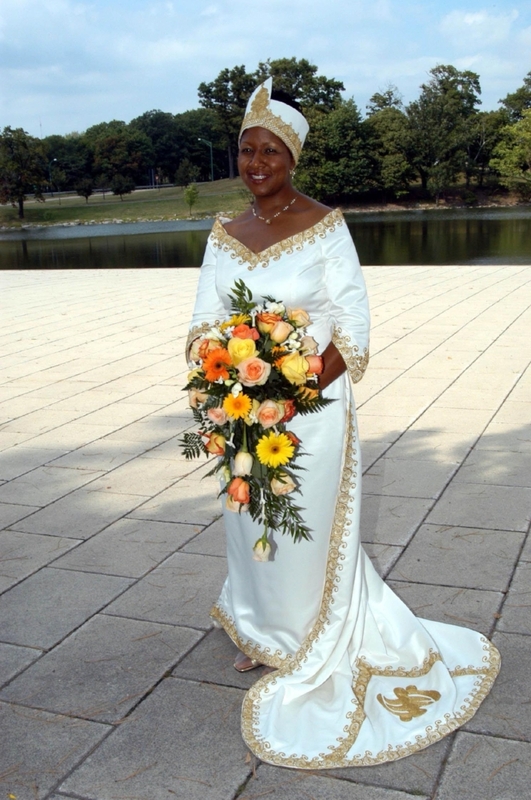 As God lives and works through me, with me, and in spite of me, this has been my truth since my initial diagnosis in 2000, and why I chose this as a central image to be displayed at my 2005 wedding to Marc – one of the most significant events of my life. You can see it prominently on our wedding cake, on the bottom of the train of my wedding gown, and on the banner. God is exceptional, and since we’re created in God’s image, we too are exceptional. Our exceptional God gave me an exceptional life, and thus it is my duty to stand out in all that I do, overcoming all odds to fulfill the plans God has for my life. The same is true for you, my friend. Today is Ash Wednesday in the Christian calendar, the beginning of Lent. Many people give up something during this season. Instead, why don’t you add something - pledge to become exceptional. Decide to be extraordinary and uncommon. Take risks, break barriers, push the known limits and move forward to do a new thing. Visualize the Gye Nyame symbol to see you and God working together so you can be exceptional, because that’s what our exceptional God created us to be. I am, and I want you to be too. May it be so. See you next week!